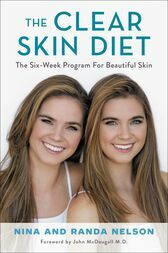 Based on solid nutritional science, vetted by top nutrition experts, and proven by the authors' experiences and now so many others, The Clear Skin Diet will help you clear your skin for good. This is it: a six-week plan to take control of skin issues using the simple principles of a low-fat vegan diet, foods such as potatoes, pasta, rice, corn, beans, oatmeal and whole grains. Complete with detailed grocery lists, simple meal prep strategies, and delicious recipes using affordable, familiar ingredients, The Clear Skin Diet is an accessible guide to curing acne that will give readers, whether 13 or 43 years old, the confidence to start living life again. Natives of Los Angeles and life-long vegans Nina and Randa were raised in the San Fernando Valley and attended Sierra Canyon School and Chaminade Prep School. They paused their college career at California State University at Northridge by taking a year off to pursue work in acting and social media. They've been busy building a successful social media presence and acting careers since.